Chalk With Me was started on June 30, 2013, as a creative project to make the language of anti-oppression and social justice more accessible. Initially it started as an inclusive online platform to encourage the sharing of this vocabulary in a fun and nonjudgemental way. Over our 15 months of chalking, CWM became more interactive as it evolved into a primarily street-art and photography based project. We wanted to colour in the gaps in our communication. 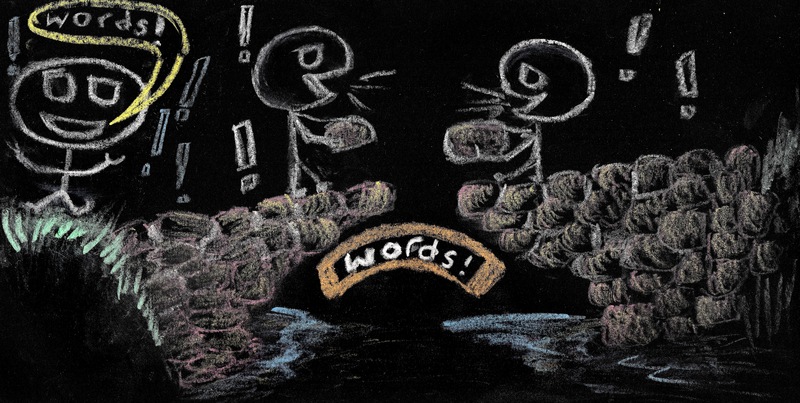 We believe words can help us connect and share ideas. However, they can also put up walls between us. Complex language can be constructive and destructive. During the initial stages of CWM, we sent out a questionnaire about words to find out how they helped and hindered people’s conversations. From June 2013 to June 2014 we collected questions and answers to help us identify words and concepts that many of us struggle with. We used some of that information to guide our chalking. Chalk is one of the first creative tools many of us use to write, draw, learn and teach. You do not need to be in a classroom to use chalk. It is used worldwide by people of all ages, in many environments and on many different surfaces. From a young age, we rely on the relationship between pictures and words to understand the world. As we get older, pictures get abandoned, and words become the device we turn to to explain and share ideas. Through Chalk With Me, we were reacquainted with pictures as teachers, and incorporated them into our understanding of complex concepts. 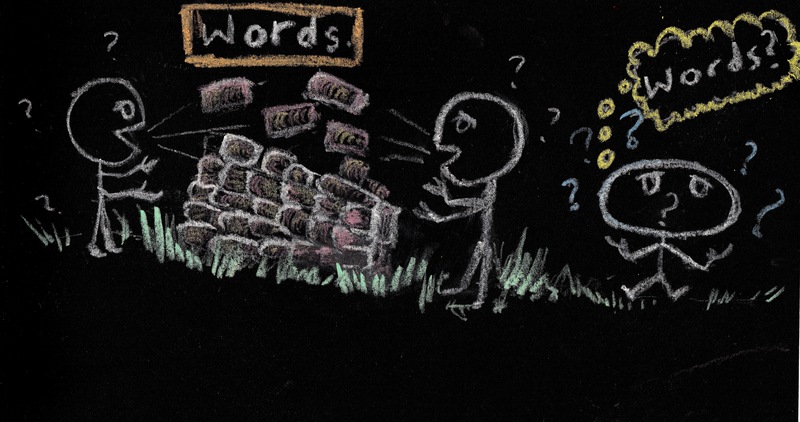 We didn’t want to just write words; we wanted to draw them, too. Check out our Gallery page to see the pictures and words we chalked out. What we learned from everyone’s responses on the CWM Questionnaire, their feedback on our online posts, and in person interactions while we chalked, inspired us to create our 2014 summer series, the Shoe Project. We found chalking in public spaces on the topic of equality to be a nonintrusive but inviting forum. Through this method we were able to engage people from diverse backgrounds with varying levels of interest in and knowledge of social justice concepts and vocabulary. As we move onto new projects we will incorporate this approach. We encourage all of you to take to the streets! Share your ideas, opinions, and knowledge with your community in creative and interactive ways. Go get everyone chalking and talking! We enjoyed watching the voyage of “Idea” unfold. The next day, the littler one of us was still talking about how Idea needed words to become real. I was the (much) taller one! Thanks for inspiring…. That is great to hear! Discussing the Idea’s journey with the both of you was wonderful, and it was particularly nice to have the littler one’s input on the art work itself 🙂 Thank you for your feedback, and we hope you both will stay tuned for more of our chalking. Organising workshops and events in schools is actually something we have started talking about! It would be great if we could get elementary school students interested, and inspired to share ideas and language. Many kids at the festival came up to chat about what was going on in our piece, and it seemed to give them something to think about. Having those conversations was a great learning experience for us, as well, and sharing ideas is exactly what we want to see more of. ArtStart could be a great resource for a project like ours; thank you for the link! Any other suggestions or input you may have for us would really be appreciated. I’ll put my mind to it….